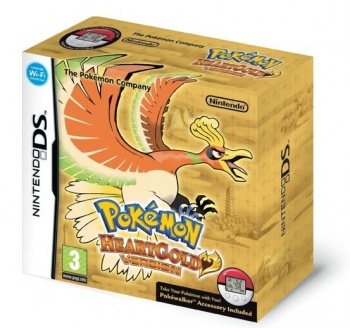 In a completely shocking turn of events, the Nintendo DS remakes of classic catch-em-all titles Pokemon Gold & Silver have sold astoundingly well. In closing off its fiscal year 2009 (ending March 31), Nintendo announced Wii Party, its latest license to print money, and also discussed which of its titles had sold more than a million units in the past year. Unsurprisingly, one (er, two) of the titles in question were the latest Pokemon games, HeartGold & SoulSilver. Nintendo revealed that the excellent remakes of the beloved Gold & Silver had sold an extremely impressive 8.4 million copies since their Japanese launch in September '09. What may be more impressive than the total number of units sold is just how quickly the game has sold. Pokemon HGSS may have sold 3.84 million copies in Japan since September, but it sold 4.62 million copies outside of Japan - a number that is all the more astounding when you realize that there were only a few weeks at best between the North American and European launches (March 17 and March 26, respectively) and the close of Nintendo's fiscal year at the end of the month. On the DS front, you have the Japan-only Tomodachi Collection which sold 3.2 million copies, Professor Layton and the Diabolical Box which sold 2.43 million copies outside of Japan (hooray! ), and Style Savvy, a game that you've probably never heard of but that somehow managed to sell 1.21 million copies in North America and Europe. Naturally, Mario Kart DS and New Super Mario Bros. sold over three million apiece. On the Wii, Nintendo's major titles - Wii Sports Resort, Wii Fit Plus and New Super Mario Bros. Wii - all sold more than 10 million copies in North America and Europe, with respective worldwide totals of 16.14 million, 12.65 million, and 14.7 million copies sold. All three of those, however, are outshone by Wii Sports, which now has a staggering estimated 63.46 million copies in circulation. Other Nintendo games to sell well include Super Smash Bros. Brawl (at 9.48 million copies sold in total), The Legend of Zelda: Spirit Tracks (2.61 million), and Mario & Luigi: Bowser's Inside Story (3.09 million). Oh please, like you're surprised.